The result was worth the wait. Homer, just two blocks from the couple’s home, opened in September near another neighborhood favorite, Bar del Corso. The exterior of the brick building is decorated with a mural on one side and a neon scrawl of the restaurant’s name on the other; Homer is also what the couple call their golden retriever, who was named for the Alaskan city where they helped run a luxury adventure lodge (complete with six-course dinners nightly) in the summer of 2013. Inside the 50-seat restaurant, Knowles’ background in interior design shines. The historic integrity of the 1925 building remains intact, but the overall vibe is timeless with a touch of whimsy: flames flickering in the open hearth and walls covered with ostrich-print wallpaper. Cox prepares dishes like turmeric-scented, charred carrots ($10) and grilled pork shoulder ($22) over the hearth’s fire, but many of the menu’s items are cooked in the kitchen’s wood-fired oven, which stays so hot that the chef schedules his day around what can be cooked when. Dishes that rely on slow roasting—such as earthy chickpeas for hummus ($8) and tender braised lamb ribs flavored with cumin ($19)—go in early. Pillowy puffs of pita bread ($16, served with labneh, hummus and roasted squash spread) are baked to order, done in just under 30 seconds when the oven is at its hottest. That bread is crucial. It comes out quick, satisfying the hunger built while waiting for a table—and there is almost always a wait at this restaurant, which has quickly become a neighborhood favorite (reservations are taken only for parties of eight or more). 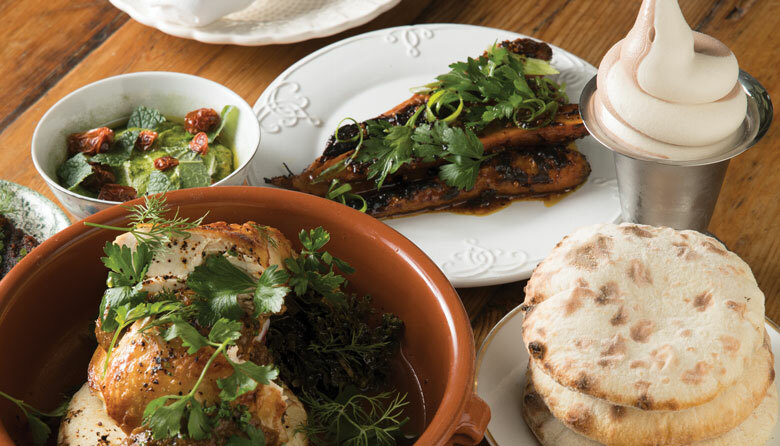 The bread goes well with the Middle Eastern/Mediterranean flavors that Cox says he naturally gravitates toward. And it’s emblematic of the kind of place he and Knowles say they’ve always wanted, where the neighborhood can sit down around a reasonably priced, high-quality, family-style meal and literally break bread together. Homer, in more ways than one, is a symbol of everything they love. End your meal with a swirl of soft-serve ice cream; or, in warmer months, pick some up at the walk-up window out front ($7 in the restaurant, $5 from the window). Flavors, which have included fig leaf and elderberry-cardamom, change bi-weekly. Knowles and Cox were excited to give the neighborhood an option for dessert and also for brunch, which they’re planning to offer in early 2019.